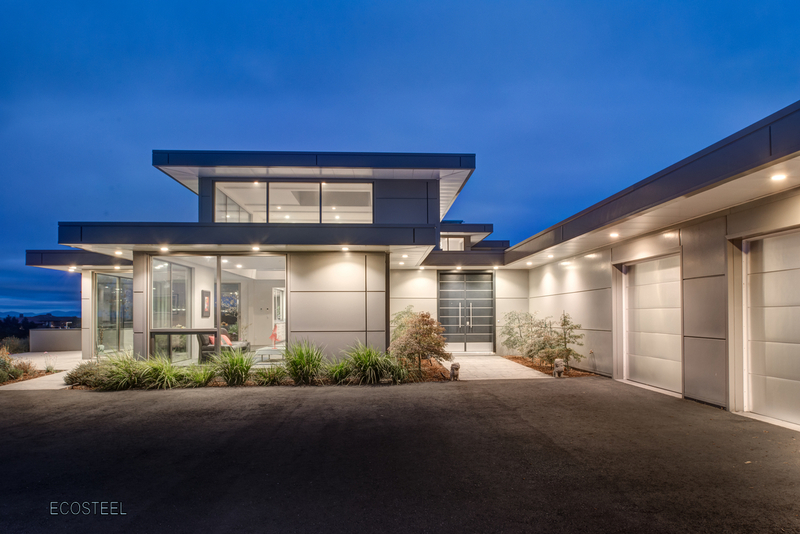 This sprawling 10,300 sq ft steel prefab home estate is perched opposite Mt. Diablo in the east hills of Danville, CA. Designed by Architect Bendrew Jong, engineered by EcoSteel, this project is now completed. "Working with EcoSteel has been great. It would not have been possible to design and build our modern dream house if we did not use EcoSteel. Conventional materials and methods would not have allowed us to get the spans required to get the open spaces and the overhangs. The steel insulated outside panels provided the clean look and finish we wanted. They have the additional benefit of being maintenance free and providing additional insulation which helps keep the house comfortable year around. What goes unappreciated is that every part of the house is straight and perfect. After watching our next door neighbor take twice the time to build using conventional materials, you really appreciate how using steel can save time and money."